We recommend checking out our discussion threads on the Teac LP-R550USB-B Turntable with CD Recorder, LPR-550USB-B, which address similar problems with connecting and setting up Turntables Teac. The user manual for the Teac LP-R550USB-B Turntable with CD Recorder, LPR-550USB-B provides necessary instructions for the proper use of the product TVs & Entertainment - Home Audio Components - Turntables. Enjoy your music in nearly all its forms with the Teac LP-R550USB-B Turntable with CD Recorder, Cassette Deck, and AM/FM Tuner. 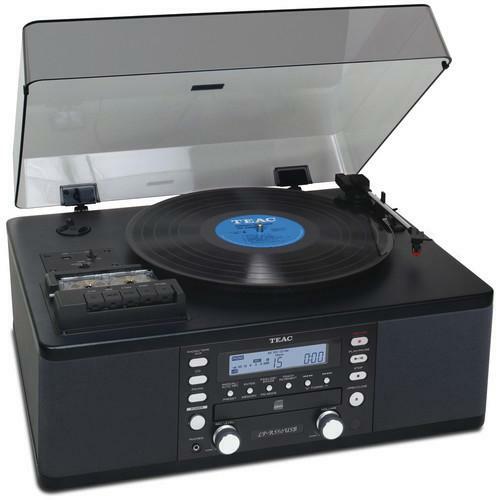 It will play your records at 33&frac13;, 45, and 78 rpm speeds, as well as audio cassettes and CDs. The turntable has a stereo RCA output if you want to play it through a separate home audio system, plus a USB output for preserving your music digitally on your computer. It will also allow you to record from a cassette, a record, the tuner, or another device via the RCA input to a CD-R or CD-RW. It includes a 45 rpm adapter, a USB cable, a stereo RCA cable, and a remote control. If you own a Teac turntables and have a user manual in electronic form, you can upload it to this website using the link on the right side of the screen. Box Dimensions (LxWxH) 22.5 x 18.1 x 12.6"
The user manual for the Teac LP-R550USB-B Turntable with CD Recorder, LPR-550USB-B can be downloaded in .pdf format if it did not come with your new turntables, although the seller is required to supply one. It is also quite common that customers throw out the user manual with the box, or put the CD away somewhere and then can’t find it. That’s why we and other Teac users keep a unique electronic library for Teac turntabless, where you can use our link to download the user manual for the Teac LP-R550USB-B Turntable with CD Recorder, LPR-550USB-B. The user manual lists all of the functions of the Teac LP-R550USB-B Turntable with CD Recorder, LPR-550USB-B, all the basic and advanced features and tells you how to use the turntables. The manual also provides troubleshooting for common problems. Even greater detail is provided by the service manual, which is not typically shipped with the product, but which can often be downloaded from Teac service. If you want to help expand our database, you can upload a link to this website to download a user manual or service manual, ideally in .pdf format. These pages are created by you – users of the Teac LP-R550USB-B Turntable with CD Recorder, LPR-550USB-B. User manuals are also available on the Teac website under TVs & Entertainment - Home Audio Components - Turntables. I have a TEAC LP-R550USB and the CD compartment wont open. I think someone has put a video-disc in in error and the track counter just flashes and when I push the compartment open button it just says “Busy”. Does anyone have any ideas how to open it? Thanks!